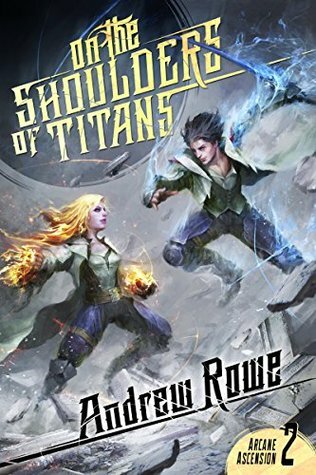 On the Shoulders of Titans by Andrew Rowe is another of those books where I’ve really struggled to put down in words exactly how I felt about the book. I can still remember stumbling across the audiobook for Sufficiently Advanced Magic while looking for something new to listen to last year and being sucked into the story almost instant. I think I could honestly say its one of my favorite audiobooks to listen to when I’m out of new things to read, so I was really looking forward to listening to On the Shoulders of Titans when it released earlier this year. I bought the audiobook as soon as I had the time and money to spare and managed to listen to the entire book in just a few short days by listening to it at work when things were slow and before bed for a few hours every night. I spent a lot of time last year keeping an eye on Andrew Rowe’s blog and waiting for news about this audiobooks release, so it almost hurts me to admit that while there were parts of On the Shoulders of Titans that I enjoyed, I was actually bored and disappointed in the first two thirds of the book. 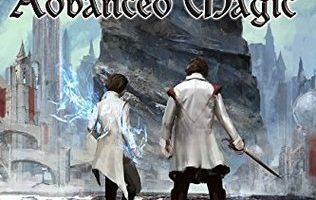 Sufficiently Advanced Magic ended in such a way that we were left with a bit of a cliffhanger and a lot of interesting questions in need of answers. So I was disappointed to find that so much of this book was spent ignoring those questions and instead focusing on Corin going to class and crafting magical items with his gift. While I can honestly say that was one of my favorite aspects of the first book, I thought that On the Shoulders of Titans spent so much time on it that it quickly became boring and a bit gratuitous. I thought it really bogged down the majority of the story and when things finally did start moving with Corin and his friends the end of the story felt really rushed like the author was trying to cram as many answers and as much action into the final act of the story. That being said, I did enjoy the end of the book more than I did the beginning and I can’t wait to see what happens next in the series. One thing I can say though is that the narration of this book was absolutely amazing. Nick Podehl has once again proven why he’s always one of the most popular audiobook narrators. Like with everything else he narrates, he somehow managed to give every character in this book their own unique voice and manages to pack enough emotion into his narration that you can really empathize and feel what the characters are feeling throughout the entire book. He never seeks to amaze me and I hope he continues to narrate the rest of this series.